Of the top five most enjoyable evenings I have ever spent in a theater (and I have spent many evenings in theaters) four of them were performances by Dame Enda Everage. Seriously, there is no other character that makes me laugh more than Dame Edna, the creation of the Australian comedy genius Barry Humphries. As funny as Ednapedia is, it is also a great way to learn more about Australian culture – popular and otherwise, and it is a total delight from cover to cover. As someone who grew up always wanting to visit Australia (I have not made it yet) I always love learning more about the island continent and now I have a few more nuggets about things I would have never been exposed to were it not for the great Dame. 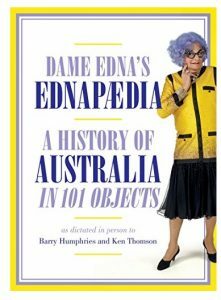 Ednapedia: A History of Australia in a Hundred Objects by Dame Edna Everage is available from Amazon and other fine booksellers.